These simple organizing secrets work for absolutely everyone! They're time tested and mom approved! While sometimes I probably appear to be Super Mom (able to find time for, then do anything and everything! ), there are obviously some (ok, many) instances I occasionally, um, gloss over… Like when I finally get the house fully clean and my toddler squishes cherries on the floor or when I’m running to Home Depot at 8:45pm in my yoga pants. 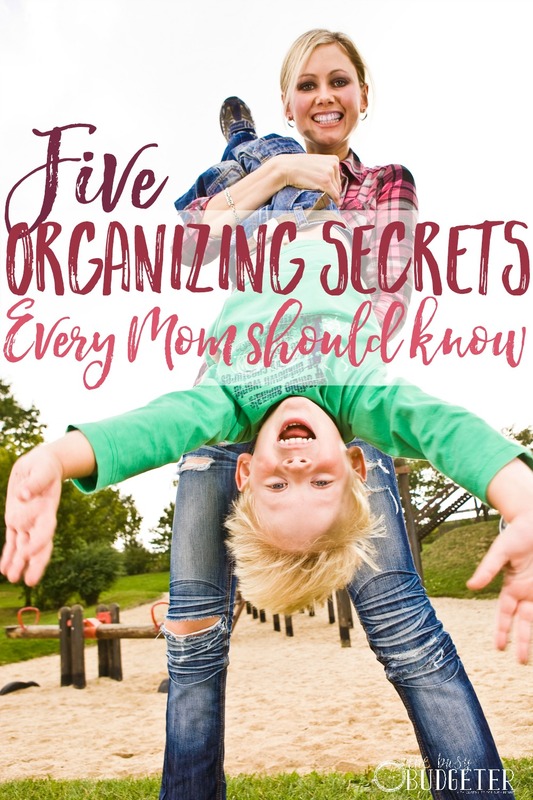 Look, I’m not the perfect parent and it took me a long time to become as organized as I am today. 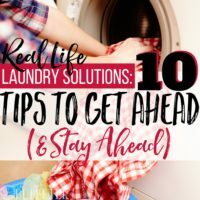 Seven years ago, I had laundry piles completely covering my apartment, my car was full of crap I bought but never used or even needed, and I couldn’t even handle the simplest of tasks because I was SO overwhelmed all the time. When you struggle with disorganization, it seeps into all areas of your life. I often felt like giving up. Now (most of the time), I’m a pretty organized person. I’m still far from perfect, but I’m proud of how far I’ve come. These days, we’re tackling new projects and my blogging business continues to grow, all while managing a house full of toddlers and a new brewery startup. I’m very thankful I learned how to implement these organizing secrets. I wake up feeling in control of my life. Like I said: not perfect. But it’s awesome compared to where I used to be. So here’s the deal: I know what works for ME might not work for YOU and I have a few things I LOVE (like planners and organizers) that you might loathe. That’s totally okay. What’s most important is finding what works for you and sticking to it. Sticking with something and giving it the ol’ college try will help you learn, grow and roll with the punches. But the basics are likely the same for both of us. There are a few “universal” organizing secrets that can be adapted to suit anyone. I (and many others I’ve heard from) find these rules of thumb helpful. For me, personally, these not-so-secret secrets changed my entire outlook on life. But listen, becoming organized doesn’t happen overnight. Don’t feel like you need to tackle all of these at once. Set a goal this month to try one of these “secrets.” You need to implement it for 28 days until you feel you’ve mastered it, then move on to the next. Let me know how they work out. Which of these organizing secrets works best for you? Truth be told, I’m a planner addict! When it comes to planners, I was initially an Erin Condren fanatic. In fact, I so longed for one of her planners (with its beautiful pages, all those great stickers, and a motivating cover to boot) that I even made my own DIY planner to tide me over while I saved up for one. Then, I had the opportunity to check out the Living Well Planner—and I was totally blown away! Don’t get me wrong, I still love the Erin Condren stickers and some of the graphics and customization options available, but the Living Well Planner is far and away the best planner option I’ve found, especially for the price. You can check out the Living Well Planner here. That said, you don’t need a fancy planner to write things down! Maybe you can’t even stand the thought of carrying around a planner or maybe you detest paper altogether. That’s totally fine. Find what floats your boat and use it. 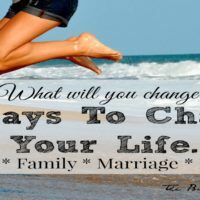 Writing things down helps you organize your thoughts and plan for your family’s future. It helps you see tangible goals and identify the steps to get there. It helps you envision the time it will take to accomplish things. Write it down. Do you want to be motivated tomorrow? Prepare the night before. If you’re working on meeting your fitness goals, put your sports bra and sneakers right by your bed so you can get them on without excuses. If you want your mornings to go more smoothly, pack your family’s lunches the night before. If you find you’re late because you spend too much time in the morning sorting through your closet and trying to decide what to wear, lay out your clothes the night before. By organizing the night before, you’re getting ahead for tomorrow. No more will you be running out the door, frazzled, frustrated and late for your kid’s next soccer practice. No longer will you show up to a meeting unprepared because you forgot the paperwork as you were leaving. You’ll never again get to a venue and realize you’ve forgotten the tickets. You won’t get to the store and forget something on your list (which you’d also have because you followed secret #1 and wrote it down)! I know you’re tired at the end of your day and you just want to fall into bed and crash. (I have little kiddos—I get it!) Take just 5 or 10 minutes to get yourself and your family organized and prepared for the day ahead. You’ll feel on top of it and in control of your entire day. When your alarm goes off, you’ll know right away what you need to do and you’ll be ready to tackle it with ease because you prepared the night before! Routines are boring, right? We all love to mix it up and experience new things. Plus, any mom with little guys or gals knows (let’s be realistic), routine isn’t always possible. Life happens and unexpected things pop up. Still, routines help us automate the small stuff and get things right the first time. Constantly feeling like you’re in “triage mode” is stressful! Be proactive and find routines that works for you and your family. Start with one uncomplicated routine, then build from there. If you don’t have one already, I recommend starting with a simple dishwashing routine. Getting your dishes done every night will hugely improve your ability to become organized in other areas of your life. Another favorite routine? Automate your shopping to cut back on time spent running back and forth to the store for items you routinely run out of or forget to pick up. You can shave HOURS off your errands every week by automating wherever possible. Plus, it’s WAY better on your budget! Automation tools can help. Set reminders to pop up on your calendar, sync your task list, and use apps to help make your phone work for you. Rituals and routines (like getting in the habit of setting up your day before you go to bed à la secret #2) can seriously make your life infinitely easier because you’ll always be prepared, even when the unexpected pops up. 4. Don’t Need It? Get Rid of It! Do you know what makes organizing easier? Having LESS to organize. For example, a few months ago I ditched my purse. It turns out, getting rid of my purse has made my life infinitely simpler and more organized! Now I know that when I go somewhere, I can just grab the few items I might need for the trip, whether it’s paperwork, a book, my lunch or whatever. I have my wallet, which holds my phone and my keys. That’s it. I can fit a lip balm in my wallet (or a feminine product, if needed). So instead of lugging around 10 pounds of garbage wherever I go, sorting through receipts and wrappers and being embarrassed when I can’t find something, I know I’ve got exactly what I need. The idea is to simplify. The same applies to other areas of your life, like your closet and your drawers. Cut back on unnecessary items and you’ll find it’s much easier to organize what you have (and keep it organized). It can be hard to get over the need to hold on to items “just in case,” but once you start cleaning out and organizing, you might be surprised at what you’re holding on to that you simply don’t need. When you do purchase organizational tools such as boxes, shelves and storage containers, be smart about what you buy. Don’t use “getting organized” as an excuse to bring in complicated items and add more clutter. Instead, look for quality tools that are well made, long-lasting, and fit within your budget. 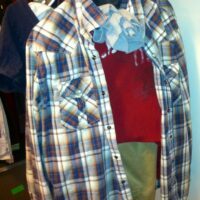 Go for simple utility over flashy and trendy and you’ll find immense benefit in the long run. I know a lot of people GROAN when they hear the word “budget.” I used to cringe at just the thought of the B-word. What changed? I realized all of these organizing secrets are intertwined. Taking an organized approach to life by writing things down, preparing the night before for a successful morning, sticking to routines, and simplifying can help you stay frugal, allowing you to stretch your budget when you need to. This was my a-ha moment! Imagine less-stressful mealtimes. You’ll be able to eat at home more often, saving you tons, because you’ll have healthy freezer meals, easy DIY TV dinners, and plans for lunches and snacks easily accessible. Can you imagine not constantly running to the store to purchase one item you forgot (and walking out with six more things than you planned to buy). You’ll be able to find things you already have, repurpose items when you need to, and find budget-friendly solutions for organizing. It all starts with a solid budget plan. It’s not going to happen overnight, but you can do this, I promise. This Free Organizing Course Changed My Life. To get started, try the 90-day Budget for Beginners Bootcamp. It’s completely FREE. This challenge changed our lives! You won’t be constantly worried about how to get to your next paycheck. Your dreams will finally seem within reach. Best of all, you’ll have a plan to get you to where you want to be. Look, none of us can do it all, and no one is Super Mom, but by staying organized you’ll free up time on your calendar and be able to narrow down goals to those you truly want to achieve. Starting today, you can be on your way to feeling more calm and more in control of your life. What are your best organizing secrets? It is so true having things written down so that they don’t disappear immediately they appear. Lol. I have a to do lists that keep me organised. I might do above my list sometimes and do lesser sometimes too but I make sure I do them eventually. Lists keep my head above water. I love journals and notebooks too that I can’t resist. Thank you for sharing your secrets they sure helps. I am working really hard at being more organized. I have always felt very organized in my head – I always remember things and never really needed to write things down – but since having a kid and staying home, I have become not so organized in my head and realized it was because I was not sticking to a routine everyday! Every morning I make sure that my bed is made, I unload the dishwasher and wash any dishes left to soak the night before, switch over laundry if need be, and just tidy up the small things that need to be done every morning. I have felt so much better since implementing these small tasks! I can focus my energy on the rest of my day and the real tasks that need to be done. 1. I had four kids with a 15 year age difference from first to last, so they were all at different levels in school (early el; middle; high school; college). They each had a clear magnetic file holder attached to the fridge with their names on them. There was a file folder in each one which was specifically for anything that had to be signed and/or returned to school. No more endless nights or frazzled mornings looking for the permissions slips, homework, report cards, you name it that needed to be returned. Anything important pertaining to that child went into their file bin. It was not stuffed with papers, by the way; just the important stuff. 2. I made a list of 24 meals, complete with any sides I was serving. On the opposite side of the meal was the list of every single ingredient I was going to need to complete that meal. (I cooked every night but one and one night was leftovers or a version of leftovers.) I divided those meals into 4 groups and each week, the night before grocery shopping day, I would take the list, copy it, and mark off what I already had available in this house. What was left was what I needed for the week to complete my meals. I had a standard list for all staples, paper/cleaning products, lunch needs, etc., which would also go along with me. The night before after clean-up from dinner, I would take the meat for the next day out of the freezer and put it in the fridge. No worries about what was for dinner the next day and the meals were only repeated once a month. I used this method for 20 years and it always works! 3. I remember reading a Berenstein Bear book where the mother went practically catatonic because her two little cubs were in so many different extracurricular activities, she couldn’t keep them straight and didn’t have the energy to do much else. We kind of got in that same rut. Talk about an “Aha!” moment! I told all my kids they could pick ONE thing to do because I just couldn’t do all that running anymore. Simplified my life incredibly! I highly recommend that method. We also did not have cable TV (on purpose) and our kids became self-entertaining and were all excellent students. 4. Each child had their own laundry basket and were taught to do their own laundry at about age 10. But before that age, they still had their own baskets and were taught to put away their own clothes. 5. I cleaned house the same day every week–Mondays. 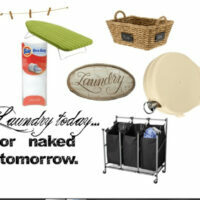 I did laundry on Tuesdays. I grocery shopped on Wednesdays. So, yes, having a routine that fits around your life and schedule is a huge help! Again, highly recommend. Organization is why some people seem to get a lot more done in their day. I can’t tell you how many people have said to me–even recently, “You seem to get a lot more done than I do even though we have the same number of hours in a day.” Yep. I have not had TV for 9 years and do not miss it. If you must, you can often get programs you want to watch (like I like the “Sherlock” series with Benedict Cumberbatch) using other devices even hooked to your TV. Television is probably the worst time drain (“toilet”) there is, followed closely by internet. You could be spending that time playing board games with your kids or reading with them or having great after dinner conversations with them. I remember my daughter brought a friend home from college and we did the usual retiring to the living room after dinner for some conversation. When they were driving back to school, her friend remarked that our family was “weird.” My daughter, of course, wanted to know what she meant by that and the friend said, “My family has never had conversation like that–ever.” My daughter told her we did it every night (remember, no cable), and the friend replied that she wished they had done that as a family. So, there you go. Just a few suggestions and some editorial, real-life scenarios. Happy organizing! Thank you Cynthia for this amazing list. Wow! Now that is an organizational system that anyone could learn from. Thank you so much for this incredible comment- I am excited to try the magnetic file holder! That is Brilliant 🙂 You are an amazing Mom, I can tell! Love Cynthia’s organizing hacks! Especially #6 because, just like a budget for finances, I learned the hard way you really do have to see where your time is going so you can focus on the areas you want to improve. That is the only way I’m able to designate time to work both outside the home and from home and keep up with a very active preschooler! Expanding on what you mentioned about automating, we love any kind of tool or technology that saves our time and helps to keep our home in order. There is the saying that you either run the day or the day runs you and we’re always trying to figure out systems to simplify so we can run the day! Couldn’t agree with this more! I love the routines one. It’s so true. They’re so boring, but so efficient. And, they make it so much less stressful for everyone!